The Great Thanksgiving Escape – ML’s Favorite Picture Book of 2014 | What is ML Reading? I know there are seven more weeks of 2014; but I am certain ML has already picked her favorite picture book of 2014. I don’t think any book released in the next few weeks can knock The Great Thanksgiving Escape by Mark Fearing off the pedestal. Summary: This story was about two cusons that are trying to get out of the house. But there a few difficulties on the way to the swingset. But when they got there it started to rain and they said “who cares. Recommendation: My favorit book Me and my mom have read together that she got from the library. A few thoughts from me (ML’s mom) Most Thanksgiving books are either boring, preachy or about a turkey trying to avoid being eaten. This is the first authentic book about modern day Thanksgiving celebrations of which I am aware. And I’m pretty in the know. I anticipate this book will become a Thanksgiving classic. 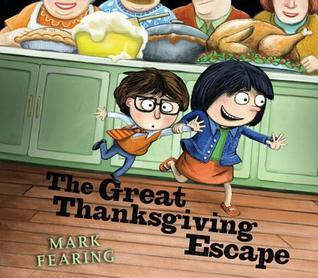 This entry was posted in Picture Book and tagged Mark Fearing, The Great Thanksgiving Escape by mlreads. Bookmark the permalink. So glad another kid has this book at home. The author sent ML a personalized copy. Pingback: ML Can’t Stop. I mean Tommy Can’t Stop | What is ML Reading?